Winning London Marathon 2011. Photos courtesy of The Telegraph. 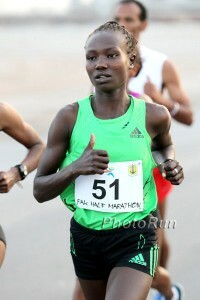 Mary Jepkosgei Keitany, the 2011 London Marathon champion, ran her first race in 2006. The Shoe4Africa road race, a 10k (but now a 5k) awarded prizes to the first 20 finishers. Mary was 21st. It could be argued that this result provided the catalyst for the altitudinal heights which the 5 ft 1” Kalenjin’s career has now reached. However, it was evident when speaking with her in Iten,Kenya, on Saturday that her granite-like determination was engrained in her long before that race. Coached by Gabriele Nicola, Keitany is now a multiple world record holder. Growing up as a child inKenya, Mary was not short of role models and she states Paul Tergat and Tegla Loroupe as her idols. Having athletes such as these to look up to not only planted the seeds of inspiration but instilled a burning desire for Mary to try and match their achievements. Gabriele elaborated on Mary’s thoughts regardingKenya’s 2012 Olympic selection:”The problem is not with selection. Although the focus of this cheerful, pocket-sized rocket is firmly set on the streets ofNew York, be under no illusions that barring injury or illness, she will unleash her artillery of weapons on her favourite course in 2012. In 2007, she made her mark internationally with a second place behind Lornah Kiplagat (who won in a world record half-marathon time) in the IAAF World Road Running Championships inUdine,Italy. Following the birth of her first child in June 2008, her first race back was the World 10km inBangalore,India, in May 2009, where she finished a very close second behind Aselefech Mergia ofEthiopiaand ran a personal best 32:09. Four months later she won the 2009 Lille Half Marathon inFrancein a time of 1:07:00–making her the seventh fastest ever over the distance. Next was the 2009 IAAF World Half Marathon Championships inBirmingham, which Keitany won, breaking the Championship record with a 1:06:36. In 2010, she broke the world record for 25 kilometers inBerlin, winning in 1:19:53 and also scooped first prize in the Abu Dhabi Half Marathon. This year she went on to break the world half marathon record in Ras Al Khaimah, UAE with a time of 1:05:50, breaking a record along the way for 20k (1:02:36) and setting world bests at 8k and 10 miles. 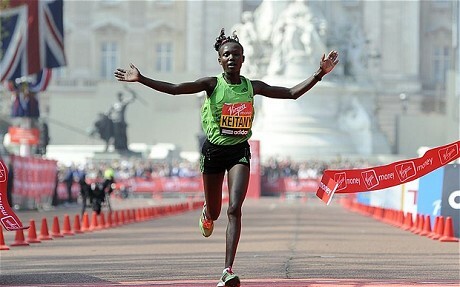 Keitany then earned her emphatic win inLondonin April, covering the 26.2 miles in 2:19:19.